ONE SIZE FITS ALL. DIMENSION W. 14" x H.18" TOTAL OF 40 PCS.IRON WEIGHTS ARE INCLUDED AND REMOVABLE. NEW DESIGN AND EASY TO FOLDABLE. Features: Our vest has two layers each side has 20 pockets and total both sides 40 heavy duty pockets that holds iron rods and extra 2 pockets for water bottle and mobile devices (select cell phones, mp3 players...) All weights are include and removable from 5 lbs to 100 lbs This makes it easy and convenient to adequately hydrate and access any pocket necessities during the breaks. 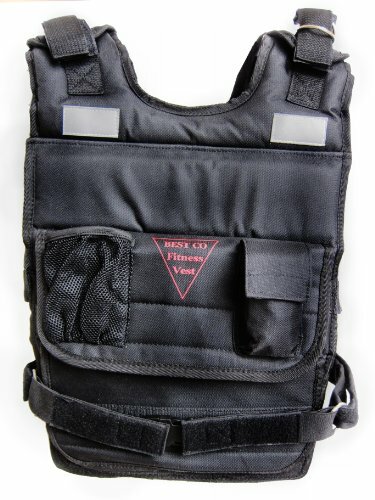 Our vests are tough and rugged, but it comes equipped with embedded padding throughout to provide added comfort during use. Adjustable velcro shoulder and torso straps offers a more snug and custom contoured fit per individual. All vests have reflective patches and strips along the front shoulder and backside, which adds to safety during nighttime training. Material: 100% high-grade Cordura® high-performance nylon SPECIAL OFFER FOR HOLIDAY DISCOUNT SHIPPING FEES CHARGE 60 LBS INSTEAD OF 100 LBS. FRONT:20 PCS.OF IRON WEIGHTS COMPARTMENTS WITH TWO LAYERS. BACK:20 PCS.OF IRON WEIGHTS WITH TWO LAYERS. TWO EXTRA POCKETS FOR WATER AND CELLUAR PHONE,MADE OF DURABLE HEAVY DUTY OF FABRIC CORDURA. V SHAPE STYLE VEST WITH COLOR BLACK. INCLUDED ONE STRAPPED AND REFLECTIVE STRIKE FROM FRONT AND REAR.